Huntley came back from a 2-0 second-half deficit to defeat Jacobs 3-2 in a match Tuesday, September 25, 2012 at Jacobs High School in Algonquin. 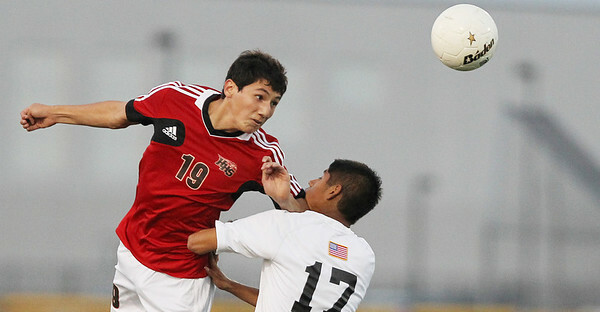 Mike Greene - mgreene@shawmedia.com Huntley's Manuel Menjivar (left) headers a ball as Jacobs' Dennis Jimenez defends during a match against Tuesday, September 25, 2012 at Jacobs High School in Algonquin. 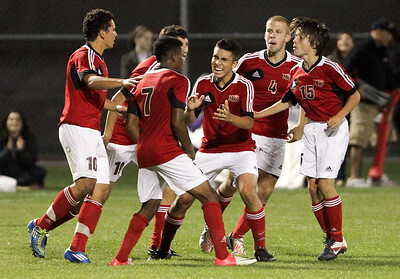 Huntley came back from a 2-0 second-half deficit to defeat Jacobs' 3-2. Mike Greene - mgreene@shawmedia.com Jacobs' Kyle Hevrdjs dribbles the ball down field during a match against Huntley Tuesday, September 25, 2012 at Jacobs High School in Algonquin. 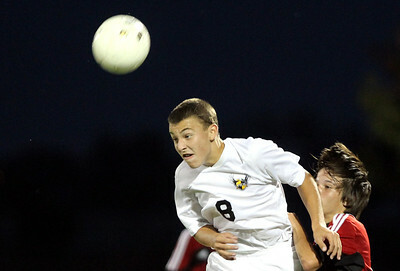 Huntley came back from a 2-0 second-half deficit to defeat Jacobs' 3-2. 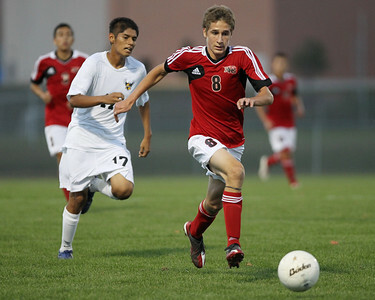 Mike Greene - mgreene@shawmedia.com Huntley's Matt Kitsis dribbles the ball down field while being pursued by Jacobs' Dennis Jiminez during a match Tuesday, September 25, 2012 at Jacobs High School in Algonquin. Huntley came back from a 2-0 second-half deficit to defeat Jacobs' 3-2. Mike Greene - mgreene@shawmedia.com Huntley's Niko Mihalopoulos (right) hits the ball while Jacobs' Anthony Bux (center) defends during a match Tuesday, September 25, 2012 at Jacobs High School in Algonquin. 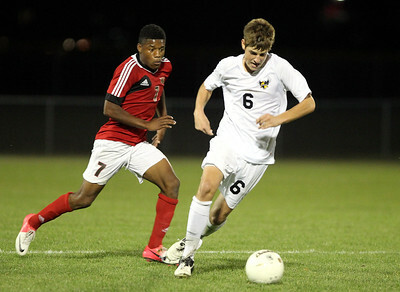 Huntley came back from a 2-0 second-half deficit to defeat Jacobs' 3-2. Mike Greene - mgreene@shawmedia.com Jacobs' defensmen (from left) Chris Rigby, Sam Tang, Mike Marnola, and Austin Ryan protect themselves as Huntley's Jaime Quintana takes a free kick during a match Tuesday, September 25, 2012 at Jacobs High School in Algonquin. 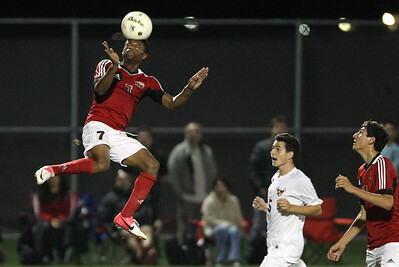 Huntley came back from a 2-0 second-half deficit to defeat Jacobs' 3-2. Mike Greene - mgreene@shawmedia.com Jacobs' Chris Rigby headers the ball during a match against Huntley Tuesday, September 25, 2012 at Jacobs High School in Algonquin. 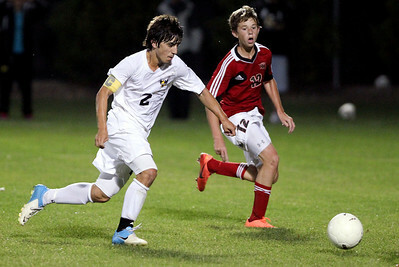 Huntley came back from a 2-0 second-half deficit to defeat Jacobs' 3-2. Mike Greene - mgreene@shawmedia.com Huntley's Lucas Baker (left) chases after Jacobs' Kyle Klatka during a match against Tuesday, September 25, 2012 at Jacobs High School in Algonquin. 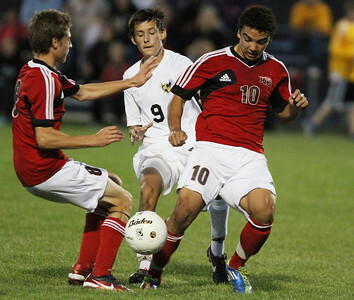 Huntley came back from a 2-0 second-half deficit to defeat Jacobs' 3-2. Mike Greene - mgreene@shawmedia.com Jacobs' goalkeeper Johan Wolf (left) reacts to a diving header by Huntley's Lucas Baker during a match Tuesday, September 25, 2012 at Jacobs High School in Algonquin. 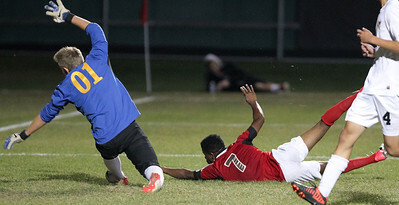 Baker scored on the attempt, helping Huntley come back from a 2-0 second-half deficit to defeat Jacobs 3-2. Mike Greene - mgreene@shawmedia.com Huntley's Christian Ramos (center) congratulates teammate Lucas Baker (#7) after scoring a goal on a diving header during a match against Jacobs Tuesday, September 25, 2012 at Jacobs High School in Algonquin. Huntley came back from a 2-0 second-half deficit to defeat Jacobs 3-2. Mike Greene - mgreene@shawmedia.com Huntley's Lucas Baker jumps high into the air to head a ball during a match against Jacobs Tuesday, September 25, 2012 at Jacobs High School in Algonquin. Huntley came back from a 2-0 second-half deficit to defeat Jacobs' 3-2. 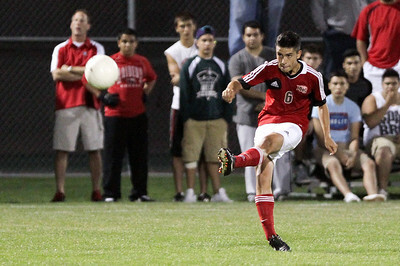 Mike Greene - mgreene@shawmedia.com Huntley's Christian Ramos hits an indirect free kick during a match against Jacobs Tuesday, September 25, 2012 at Jacobs High School in Algonquin. Ramos scored a goal on the kick after Jacobs' goalkeeper touched the ball. Huntley came back from a 2-0 second-half deficit to defeat Jacobs 3-2. Mike Greene - mgreene@shawmedia.com Jacobs' Anthony Moscatello (left) drives towards the goal while being defended by Huntley's Jason Zobott during a match Tuesday, September 25, 2012 at Jacobs High School in Algonquin. 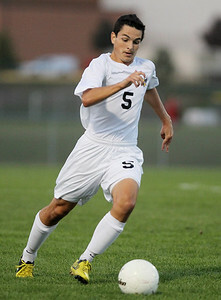 Moscatello scored a goal in Jacobs' 3-2 loss to Huntley. 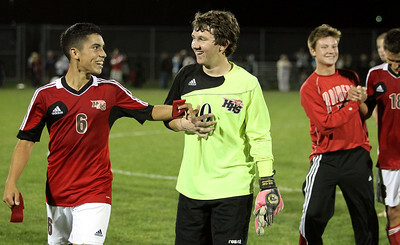 Mike Greene - mgreene@shawmedia.com Huntley's Christian Ramos celebrates with teammate Austen Emery after their team came back from a 2-0 second-half deficit to defeat Jacobs' 3-2 in a match Tuesday, September 25, 2012 at Jacobs High School in Algonquin. Huntley's Christian Ramos (center) congratulates teammate Lucas Baker (#7) after scoring a goal on a diving header during a match against Jacobs Tuesday, September 25, 2012 at Jacobs High School in Algonquin. Huntley came back from a 2-0 second-half deficit to defeat Jacobs 3-2.